The String of Pearls: A Romance is the title of a story first published as a penny part serial 1846-47. 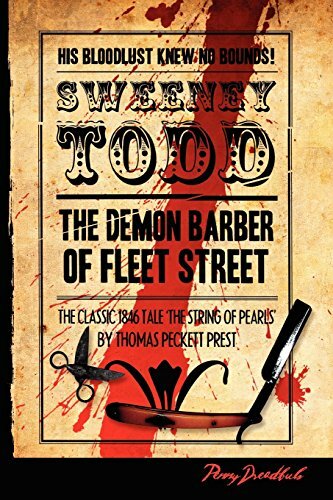 The main antagonist of the story is the infamous Sweeney Todd, "the Demon Barber of Fleet Street", who here makes his literary debut. Thomas Peckett Prest (AKA Thomas Preskett Prest) (probable dates 1810-1859) was a British hack writer, journalist and musician. He was a prolific producer of penny dreadfuls. He is now remembered as the creator of the fictional Sweeney Todd, the 'demon barber' immortalized in his The String of Pearls: A Romance. He has also been associated with the authorship of Varney the Vampire, now more often thought to be the work of J. M. Rymer. He wrote under pseudonyms including Bos, a takeoff of Charles Dickens' own pen name, Boz. Before joining Edward Lloyd's publishing factory, Prest had made a name for himself as a talented musician and composer.